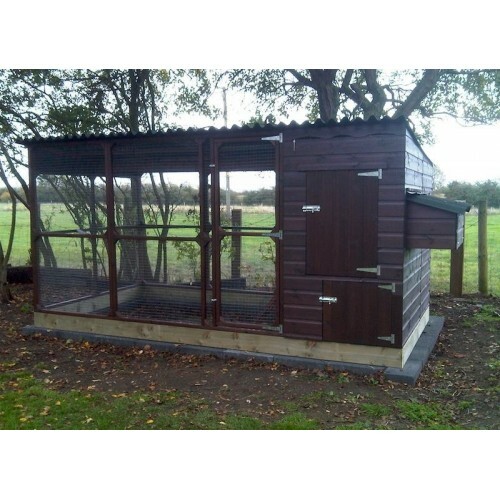 Large Chicken House with large walk in Chicken Run is suitable for Chicken keepers who are unable to let their Chickens free range due to predators, big enough for Chickens to stretch their wings, easy clean fox proof Chicken Coop. The roofed Chicken Run is 8 feet 6 inches long and is 6 feet deep. The Run roofing stops the run becoming a mud bath in the Winter and is of Onduline and matches the Hen House roofing. 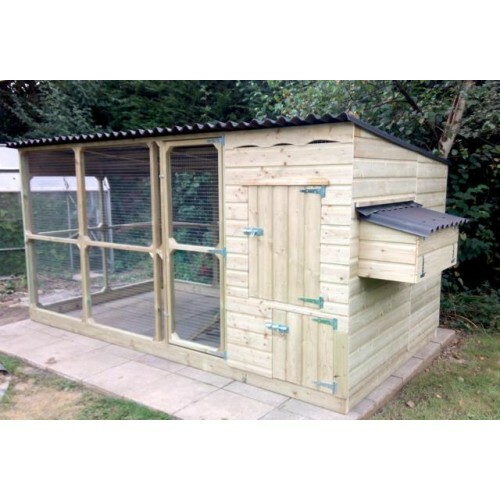 The Chicken House, Chicken Run and Nest Boxes all have Onduline roofing which is the preferred roofing for Poultry as it does not harbour parasitic red mite unlike felt plus it outlast normal felt by years and years, it also allows vital air circulation through the Chicken House. 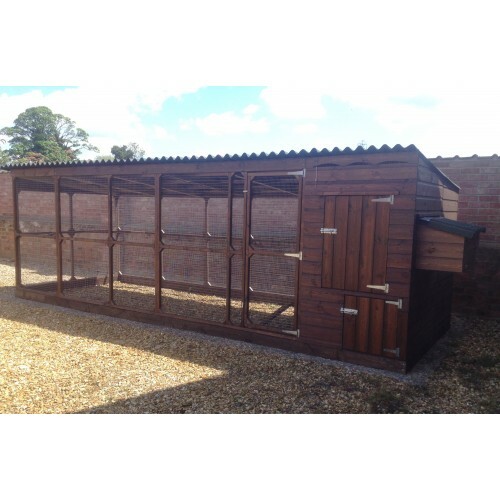 The Shiplap cladding to the Chicken House and all Run framework is smooth square planed tanalised pressure treated timber for excellent rot protection and is screwed together for strength and durability, the finish is a natural colour. 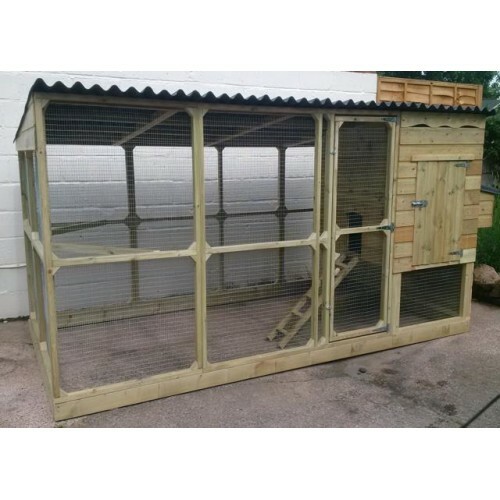 Additional Option - The underneath of the Chicken House, the Chicken Run end and back of the Chicken House can be fully weather boarded to make a complete closed end to give shelter to the Chickens from driving wind and rain, we also create a small door under the main House door so feeders and drinkers can be placed underneath the House. 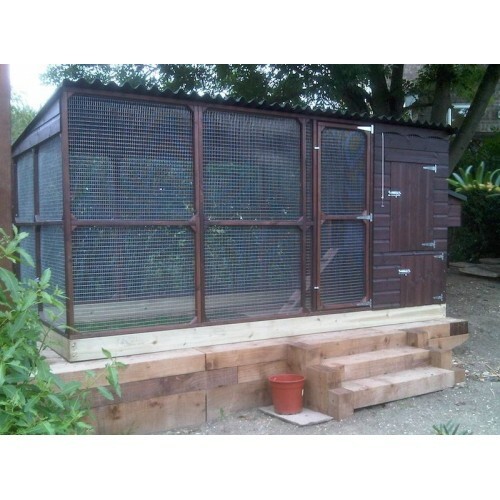 Additional Option - The Chicken Run length can be increased by adding panels in modules of approx 3 feet long, each module has a front and back panel plus Onduline roofing with supports. Additional Option - VSBi Automatic Door Openers can be fitted inside the House and will take care of opening and closing the pop hole door. Additional Option - We can finish our Housing in many colours, we use mainly Cuprinol Garden Shades or the Farrow and Ball range of exterior paints. Additional Option - Extra deep base bearers which are tanalised rot proof bearers which are assembled on site and the whole assembly is built onto them. These extra deep rails act as a kick board and raise the height by a couple of inches, they also provide a sturdy strong platform onto which we build the Chicken House and Run. 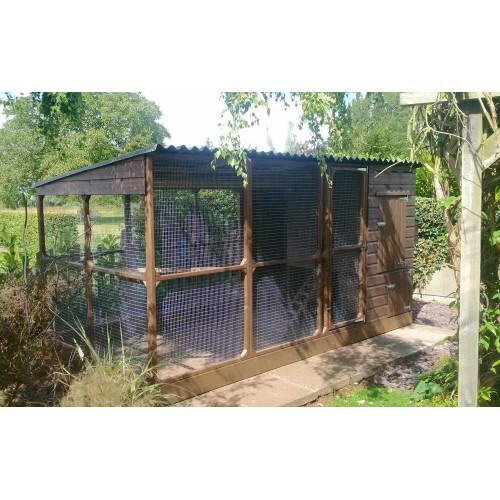 Additional Option- Mesh Aprons can be fitted around the perimeter of our Chicken Houses and Chicken Runs and will prevent a fox from digging/scratching into the Run. 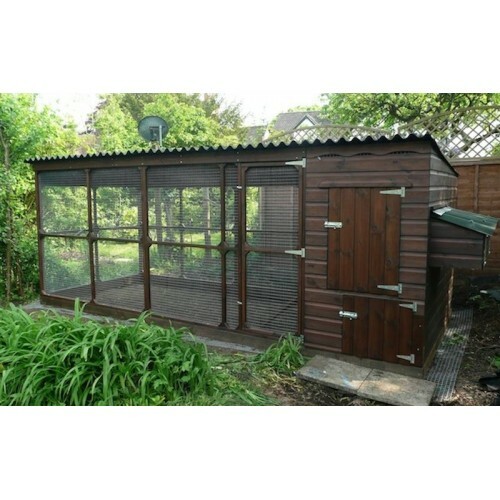 great fun and super quality..
We've had our coop for about a month now and it's great. Fabulous size for our 5 girls who happily spend all day in when I'm at work. Very easy to clean out with removable perches and board between the nest boxes. Looks good too! A big thank you for a quality house. 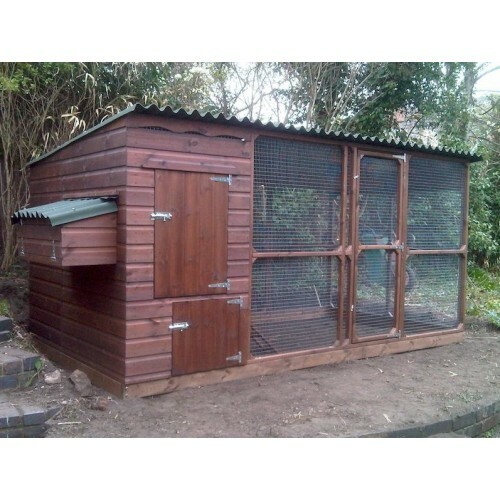 ..
Mark & Ian built our henhouse and run with great care & expertise. It was wonderful not having to battle with a pallet of bits! Our five ex-batts arrived at the beginning of the first cold snap, with few feathers, bruised and limping. Despite the cold they looked as if they had swapped chicken hell for chicken heaven! We had chosen a Super James because there are so many foxes around here that a h.. 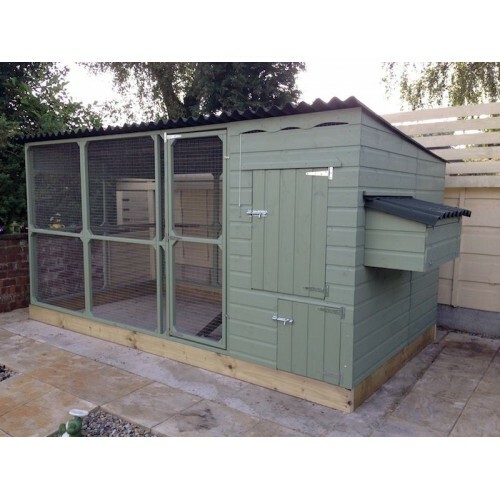 It took us ages to find a coop we both liked, I wanted it to look nice and the other half wanted it to be practical! So glad we finally chose The James Super as it is both.From ordering to installation the whole experience was pain free. 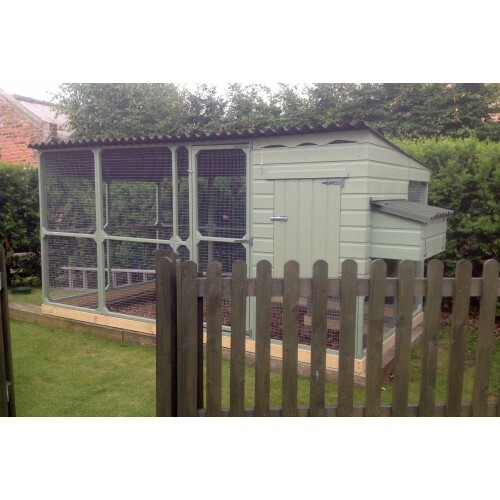 Our existing base was too small for this coop so it was made slightly shorter for us with no fuss at all. 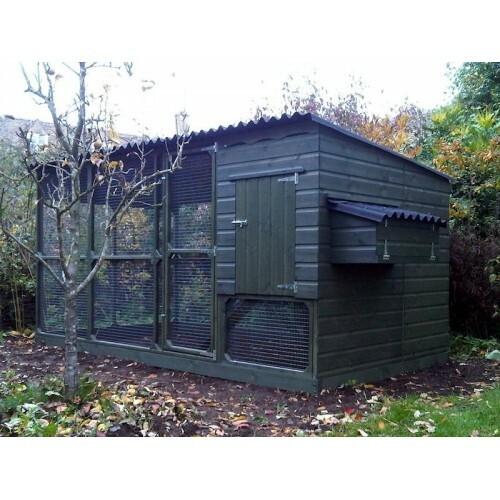 We live in a pretty exposed area so have also had p..
My new James Super hen house was delivered and erected in scorching heat! 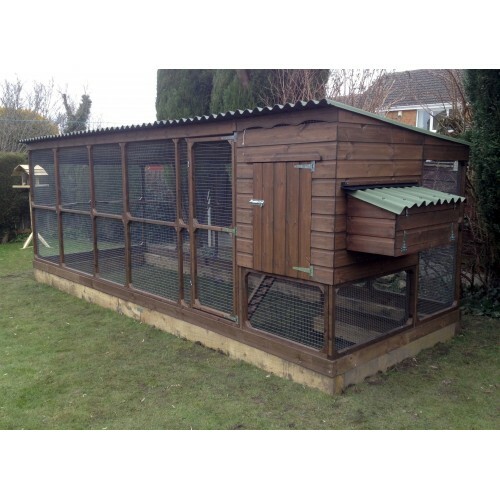 Beautiful job, excellent quality house, really solid and fox proof! Lovely design, worth paying a little extra for. Thank You!.. We have had an Eglu for the past 5 years but felt that our "girls" might be happier with a bit more space to wander around in. After looking at the cheaper end of the market on ebay, we came across the woodenart website and were immediately impressed by the obvious care and attention to detail that went into the construction of their products.Mark couldn't have been more helpful when discu..
Dear Mark, We just wanted to thank you again for our lovely, lovely James Super Chicken House and Run with extension. You may recall that just a few days after that bleak day in November when you did such a fantastic assembly job, we had that huge dump of snow that didn't really go until January. The ground was so hard we couldn't do anything about preparing the area for our girls, and they final.. The girls have had their new home for two months now, and they love it as much as we do. 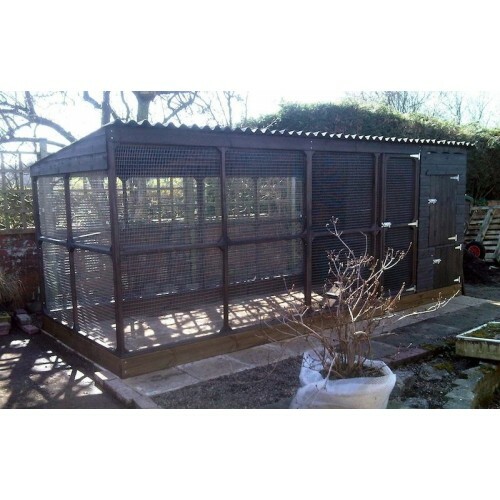 The build quality is fantastic, it is easy to keep clean and it looks amazing in our garden.Mark was so helpful throughout the ordering process. He answered all my questions promptly and gave me loads of advice. I would recommend Woodenart to anyone.Thanks Mark & Ian! 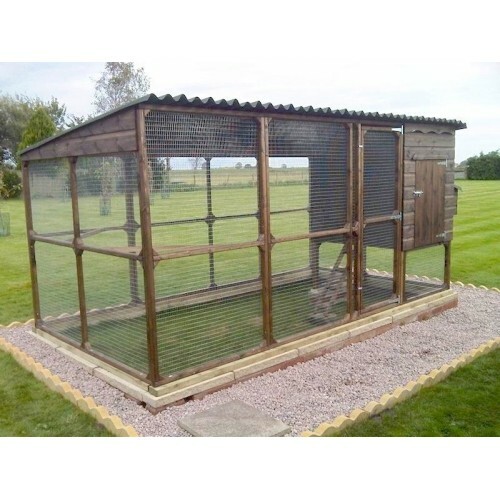 ..
Chicken House with large walk in Chicken Run is suitable for keepers who are unable to let their Chi..
Chicken House with walk in roofed weatherproof Chicken Run is suitable for Chickens Bantams and Layi..
Large Chicken House with large Chicken Run suitable for all Poultry an easy clean fox proof Coop wit..
Chicken House with Chicken Run is suitable for gardens to allotments to orchards, an easy clea..
We are fitting more and more Automatic Door Openers to our Chicken Houses, and having used them for ..